(a) How long can you play tennis on the 800 kJ (about 200 kcal) of energy in a candy bar? (b) Does this seem like a long time? Discuss why exercise is necessary but may not be sufficient to cause a person to lose weight. b) Yes, this is surprisingly long. A lot of exercise is needed to burn more energy than what is consumed, although exercise also causes the amount of energy burned while at rest to also increase. Exercise increases the resting metabolic rate, in other words. This is College Physics Answers with Shaun Dychko. The power consumed while playing tennis equals the energy consumed divided by the time. So we can solve this for time by multiplying both sides by t over P in and we get the time that the person can play tennis equals the energy input of the candy bar divided by the power consumed during the tennis activity. So that's 800 kilojoules which is times ten to the three joules, divided by 440 watts and then we'll multiply this by one minute for every 60 seconds to get our answer in minutes. We have 30.3 minutes of tennis can be played just on the energy in the candy bar which is surprisingly long and it means that a lot of exercise is needed to burn more energy than what's consumed which is what has to happen in order for weight loss to occur. More energy has to be burned than consumed. But there is more to the story than this because exercise also causes your resting metabolic rate to increase which means that while resting, the amount of energy your body is burning is greater than it would otherwise be. 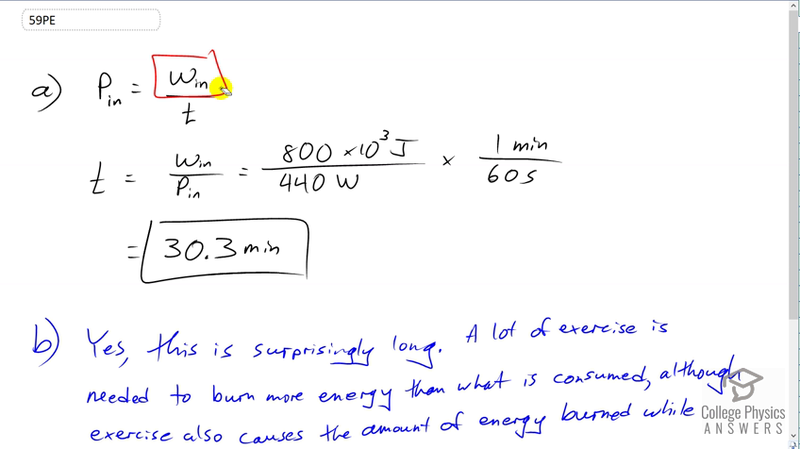 So exercise causes not only the energy during the activity to be burned but it also causes an additional amount of energy while resting to be burned as well.